Despite Mauritius being a rather small territory, each region has its own identity and vibe. 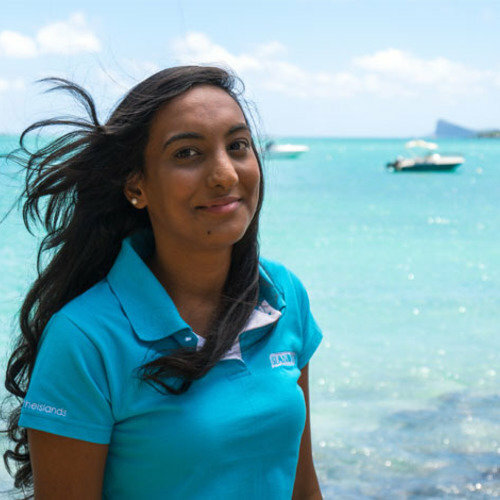 Despite Mauritius being a rather small territory, each region has its own identity and vibe. Cruising along the coastline allows you to glimpse the many aspects of Mauritian culture - from craggy mountains to an old city-port, from sampling deep-fried gajaks to bicycling around a traditional village, from a lavender colonial chateau to a village of pastel-coloured houses… What distinguishes Mauritius from other similar destinations is the mélange of cultures, ancestral rites, accents, faiths, foods and people. From the southern tip to the northern islands, immerse yourself in a rich, vibrant culture - with a few swims in the warm sea along the way. - Meals and drinks not mentioned as included. Upon your arrival at SSR International Airport, you will be greeted then taken to the jetty at La Balise Marina in Rivière-Noire on the island’s west coast, to embark on the catamaran, Chaka. Mid-morning you will set sail to Bénitiers, a crescent-shaped island off the coast. The immensity of the lagoon is striking at first, as is its color - turquoise and limpid like a swimming pool. Slip on your fins, mask, and tuba to glimpse pods of Bottlenose or Spinner dolphins in their natural habitat. Lunch onboard. Mid-afternoon you will head to Le Morne, the craggy majestic mountain that bears witness to the Maroons, and a UNESCO World Heritage Site. The coastline is studded with small fishing villages, surf shops, and mangroves. Before the sun dips into the ocean, you may glimpse Reunion island, 226 kilometers away. Dinner and night onboard. Nibble on some toast, locally made jams, eggs and bacon and seasonal fruit before you set sail for Port Louis, the historic capital. Once the catamaran is docked in the marina at the Caudan Waterfront, the crew will serve lunch. Spend the afternoon perusing the boutiques at the Caudan or wander into the city with its cobblestone streets lined with colonial buildings, century-old fruit trees, street food vendors and rows of tiny shops. The Caudan, situated on the waterfront, has a cool craft market, cafés, cinemas, a bookstore -the shelves filled with Mauritian authors-, boutiques and a museum, The Blue Penny. Rise early for a light breakfast before going ashore for a “My Moris” cultural and culinary tour on foot of the cosmopolitan city. The charming My Moris guides will take you along alleys and backstreets that conceal hot steaming street food - from piquant Indian rotis to steamed Chinese pastries, from a tea house to a ‘corridor’ restaurant. Sample the ethnic foods eaten by all communities and the local way of living while they narrate the story of the Mauritian people. A late lunch will be served onboard before sailing to Grand Baie in the north of the island. The catamaran will moor in the bay of Grand Baie, a local favorite. The coastline, a trendy strip of bars and boutiques, scintillates come nightfall. You may go ashore to experience the local nightlife. Off the north coast are several volcanic rock islands, which can be reached by boat: Gunner’s Quoin, Flat Island, Round Island, Gabriel Island, Serpent Island, Pigeon House Rock.... Keep your snorkeling gear at hand as you will be spending the day island hopping between Flat Island and Gabriel Island. Breakfast will be served onboard before you set sail for the first halt: Flat Island - on which stands a lighthouse and the ruins of an ancient quarantine. Weather permitting, the catamaran will drop anchor in Baie des Palissades, on the west side of the islet. Jump into the warm blue waters and explore the reef. The crew will prepare fresh salads and a barbecue for lunch. The next halt is Gabriel Island, an islet fringed with blond beaches, which appear to widen at low tide. Now is the time to work on your tan. Cool off from the heat with a dip in the surrounding shallows. Enjoy the last rays of this balmy day before you head back to Grand Baie. Dinner and night onboard. Sip a cup of vanilla tea as Grand Bay awakens: vendors set up their food carts, shop owners pull up noisy metal roller shutters and hand-painted battered buses pull up to seemingly ‘invisible’ bus stops. The catamaran will dock the 20˚ Sud, a boutique luxury hotel set on a private coconut-studded beach near Pointe aux Canonniers, a bike-ride away from the heart of Grand Baie. The colonial style edifice, with its wood columns and veranda, is tastefully decorated. Hand-picked antiques are scattered throughout the 36 rooms and suites. The enticing menu, poolside deck and stunning views of the sea make for a perfectly enjoyable lunch. The afternoon can be spent reading a good book on a chaise longue by the pool, kayaking in the bay or going for a bicycle ride. A number of sea activities are available. Around 4 o’clock is tea-time. The house-made cake is served with tea - add plenty of milk and sugar to drink it the local way. Breakfast at 20˚ Sud is the perfect fantasy of what a hotel breakfast should be: that is, served buffet style in a gorgeous setting. Private transfer to Poudre d’Or, on the north-east coast at 8.15am for a “My Moris” cultural bicycle tour. The cultured My Moris guides will take you along the winding streets of Poudre d’Or, a village by the sea which flourished during the golden age of the sugarcane industry before nearly disappearing off the map. A fictitious Poudre d’Or exists in literature: there is something poetic about the small village filled with places of worship, gardens crammed with flowers and candy-colored houses. Private transfer back to your hotel at noon. Spend your afternoon lazing around the hotel until dinner time. At the 20˚ Sud farm-to-fork eating is a year-round affair. The Chef Sanjeev Purahoo concocts sumptuous dishes of freshly caught fish -ombrine, vieille rouge, and dorade-, meat, poultry and vegetables from the garden. Enjoy the breakfast buffet before heading to the Domaine de Labourdonnais, an old sugar estate. Amidst the stunning gardens and century-old Intendance trees, sits a lavender colonial home, an architectural gem built in 1856, referred to as “le château.” The restored edifice has been converted into a museum containing artifacts, letters, furniture, silverware and porcelain belonging to the family. After touring the château, you are invited to sample house-made fruit candies and rum arrangé -rum in which fruits and spices, left to macerate, infuse the liqueur. The Domaine de Labourdonnais produces fruit-based products ranging from jams that blend exotic fruits and spices (we recommend the vanilla-papaya jam), guava paste and fruit candies, sorbets and fresh juices, including a cool minty mango-mint blend. Take a stroll in the orchards from which the fruits are picked before sitting down for lunch at La Table du Château where Chef Fabio’s creative seasonal menu is packed with local produce from the orchards. His innovative cuisine incorporates elements of Mauritian cuisine, such as green papaya, green banana, lady fingers, heart of palm, combava - kaffir lime -, chouchou - chayote - and salt from “les Salines” in Tamarin with the classics. Private transfer back to your hotel. You have some time to pack before your transfer to the SSR International Airport.